hope you guys are doing great!!! miss you! We were out of town on business and were also getting to visit with some of our out of town friends. We invited them to our hotel's pool and got to hang out and enjoy it for all of three minutes. Iris had apparently, out of fear of drowning, decided it would be better to jump into the pool very close to the pool wall instead of out into the middle of the water. Then, mid-jump, she spun around and brought her chin crashing down on the concrete wall. All the kids were terrified for her. She was afraid she was going to die. All adults involved, I'm happy to say, managed to remain calm. We quickly got everyone in dry clothes and took her to the hospital. She got seven. We had an iffy Dr. While, it appears he did a fabulous job with the stitches themselves, he lacked a little skill in dealing with children. He also refused to numb her further when it was obvious she was in pain. But she was quite a trooper and didn't fight, or scream. While he stitched away, she would just say, "OW" and kind of flinch while big ole tears rolled down her face. The next day she was as good as new and played with her friends like nothing ever happened! partly to sooth the wee ones and partly because it was just SO CUTE! The kids named her Daffodil. Shortly after we got her, Stephen read that it was illegal to keep native species as pets. This, to us, was a stupid law...seeing as how rabbits, turtles, tadpoles and praying mantises all make great pets, but we decided we better obey it, so our kids don't disobey our "stupid" rules. due to a crazy summer, father's day and birthdays for Stephen and Papa were neglected on my blog. we ate at Macaroni Grill, more because Lu eats there easily, than because it was a favorite of the birthday boys....cause they love that girl! he got a deer rifle that had to encompass father's day and birthday and is not pictured due to respect for my mom's firm dislike of guns. Shortly after Stephen and I got married and moved to Dallas, Texas, I started crying alot. I was so lonely without my family and friends. 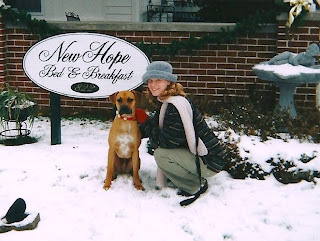 Then I started pleading with my husband to understand why we DESPERATELY needed a dog in our one bedroom apartment. Growing up, none of his puppies lasted long, they died or ran away. So his memories of pet-ownership were not positive ones. But seeing as how his new bride of 2 weeks was moping about and crying all of the time, I think he didn't feel he had much of an option. We arrived at the Dallas Pet Adoption Agency (I learned the hard way not to call them an animal shelter) and were given a tour of all the dogs by the 12 year old son of the owner. Stephen tried to steer me to the calm looking small dogs. The boy tried to assure me that the pitbulls and chowchows were splendid. But I saw this beautiful boxer/rhodesian ridgeback mix jumping up on his cage door and NOT barking (a plus in an apartment) and asked to go in the run with him. Stephen and the boy seemed a little surprised, but let me in. I sat on the concrete ground to watch him and let him smell me, but he just curled his tall, lean body up in my lap...guess he thought he was a lap dog. "Kizzy" was Lucy's first word. 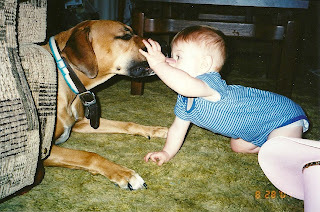 He was very patient and tolerant of all of our children. 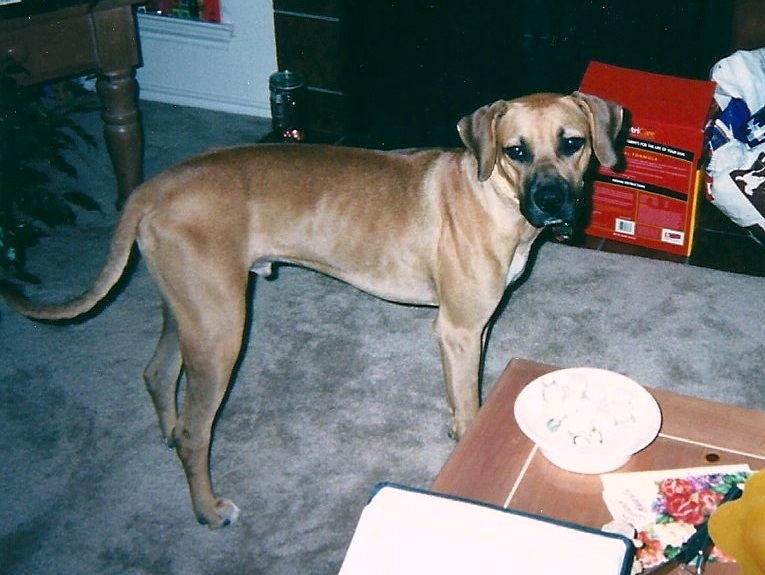 Around the time Clyde was born he was booted out to become an outside dog. He loved being an inside or outside dog! Shortly after this we had to move to Tullahoma and couldn't find a single rental home or apartment that would accept a dog his size. My Dad had always coveted our precious pooch, so the obvious choice was to send him to live with Grandad and Grandmom :) He never came back. They loved him so much, that even once we got a house, we knew we could never ask for him back. It was all just as well, however, because shortly after that, we found out Lucy had a severe dog allergy and that our house was infested with a permanent pest and we could not keep it. We got to see and enjoy him at my Dad's everytime we visited. He would "sing" with my Dad as he played the saxophone. It was very cool! The kids would fight over who got to feed him a dog biscuit. We always took him on our long hikes in the woods. Just a few weeks ago, Dad and Janet had to put him to sleep due to a tumor growing that they had already tried to have surgically removed. It was awful. It was awful on my Dad and Janet who just loved him so much and had to get used to him not being around. It was awful on Stephen, Sherry and I because we had just adored that dog...he had been around the 11 years Stephen and I have been married. And it was awful on the kids. Lucy took it particularly hard. She hated to think about how sad Grandad was and she just couldn't imagine not having Kizzy around, because he had always been there as far back as she could remember. I was very surprised she was able to put words to her feelings as she normally struggles with this. They cried on and off all day. They just sobbed. And they just couldn't bear to go to bed. I let them come lay in my bed, but then they wanted me. They cried and cried some more. Suddenly Clyde sat up and prayed, "God thank you, for making this wonderful dog. He was so special and kind-hearted. There was no other dog like him and he loved us and we loved him....in Jesus name...Amen." And then, of course, I cried like a baby. Stephen came in and observed, "Well, they certainly eulogized him well." Then he picked each one up off me and carried them to their beds. Seeing as how older two siblings were exposed to this ride since they were three, we can only conclude that age is not a determining factor of enjoyment. Therefore, it must be birth order. Do not take "the Baby" of the family on this ride. I just have to praise my God for a really perfect weekend which He has just granted us. A time to just really absorb having us all relaxed together and enjoying one another. these two....always chattin it up....for which I am very grateful!